Installing a heat mirror. The shiny surface of a radiant barrier reflects radiant energy but won’t slow the movement of heat by convection or conduction. When installed in an attic, a radiant barrier can help reduce heating and cooling costs by reflecting radiant energy. During summer months, a radiant barrier reflects the sun’s heat energy back toward the roof, helping to keep the attic cooler. In wintertime, the radiant barrier reflects heat from the house back toward the living space. Energy savings with radiant barriers will be greatest in hot zones where air conditioning systems need to operate frequently to maintain comfortable interior temperatures. In these areas, a radiant barrier can cut cooling costs by as much as 17%. Radiant barriers are sometimes referred to as "radiant barrier insulation," and this can cause some confusion about improving home energy performance. Heat always moves from hot to cold, and it can move by conduction, convection and radiation. A radiant barrier slows the movement of heat by reflecting radiant energy. To slow convective heat loss, it's necessary to seal air leaks. To slow conductive heat loss, we add insulation. The most common type of radiant barrier is a plastic sheet that has a reflective foil facing on one or both sides. This type of radiant barrier is usually installed in the attic, stapled to the bottom edges of attic rafters. Some types of rigid foam and fiberglass batt insulation are faced with radiant barrier material, so they can provide the benefits of insulation and a heat-reflecting barrier. Still other radiant barriers are incorporated in a plastic, bubble-wrap material that can be stapled into place just like standard plastic sheet material. As explained above, a radiant barrier isn't a substitute for insulation. But it can be an excellent compliment to an attic energy upgrade that includes air sealing and additional insulation. 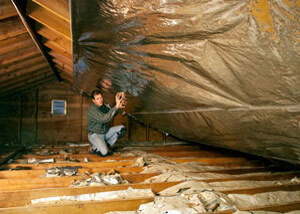 If you have ductwork in your attic, or use your attic to store household items, a radiant barrier is often recommended. If you’d like to find out more, contact an experienced home insulation contractor in your area.